Christmas with Cookie (2016) - Sci-fi-central.com. USA  2016  53m   Directed by: Alan Maxson, Shawn Schminke.  Starring: Alan Maxson, Dana Austen, Justin Armao, Breeanna Judy, Tk Gorgonia, Allie Rivera, Evan Mack, Kevin Lau, Matt Kelly, Tim Parker, Noel Jason Scott, Shawn Schminke, Sean T. Lafferty.  Music by: Tim Parker. In the year 3978 global warming has made a desert of the North Pole. Santa & Mrs. Claus battle angry skeletons who didn't get what they wanted for Christmas. Evil aliens try to take over the world and a giant abominable snow man wants Santa for his next meal! Christmas WITH COOKIE is a sci fifantasyhorror spoof about a futuristic Santa Claus and his tribulations. It's posited as a comedy with a non-existent budget, and having just watched it, I'm still clueless as to what it was all about. It sees Santa and his wife doing battle against living skeletons, alien greys, and even the Yeti himself in a wide-reaching yet completely nonsensical storyline. 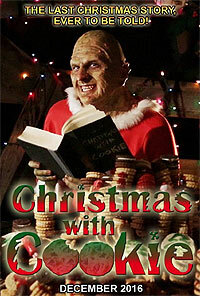 The film is narrated by an ugly elf creature living in outer space. The actor is doing his best Freddy Krueger impersonation but his wisecracks are dreadful. The skeletons are simply plastic toys while the aliens are people in masks. Half of the running time is made up of characters wandering around a desert landscape. The acting is very bad and the film is deeply unfunny.